Big Bomb from Bomb Seeds are feminised cannabis seeds that, together with the THC Bomb, produce the highest yield per weed plant. This nice weed strain is originated by crossing two famous strains, namely the Big Bud x Bomb #1. This has resulted in a nice weed plant with balanced Indica and Sativa genetics. 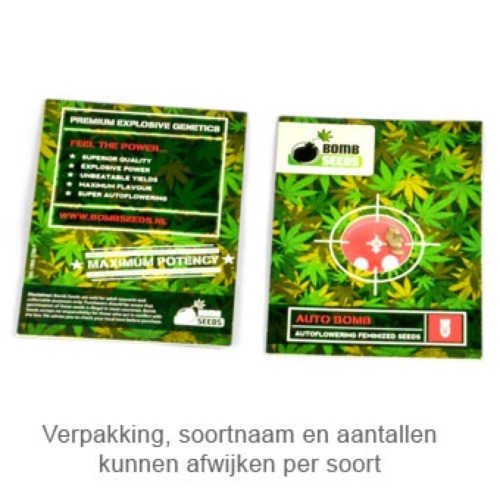 Bomb Seeds Big Bomb is a powerful weed strain which contains an average content of THC. This weed is easy to grow and produces hard buds due to the addition of Bomb #1. These weed seeds are appropriate for an indoor grow and outdoor grow. The quality of these feminised cannabis seeds is perfect. These seeds have a good germination. This plant produces a very high yield. By smoking this weed strain you experience a classic skunk taste and smell with a long term relaxed effect. Tell us and our customers what you think of the Big Bomb from Bomb Seeds.